Globally more than 18 million hectares of tree cover lost in 2013, but rates of loss in Indonesia showed signs of slowing. WASHINGTON (April 2, 2015)— Northern boreal forests, primarily in Russia and Canada, suffered significant tree cover loss in 2013, largely driven by large forest fires, according to new data and high-resolution satellite-based maps released by Global Forest Watch, a partnership led by the World Resources Institute. New data show Russia and Canada (two of the biggest forest countries in the world) accounted for 34 percent of global tree cover loss from 2011-2013, losing a combined average of nearly 6.8 million hectares (26,000 square miles) each year, an area equivalent to the size of Ireland. Some of the tree cover loss is only temporary, as forests can regenerate after disturbances such as fire though in the boreal region this is a very slow process. Russia (4.3 million hectares) had nearly double the tree cover loss of Canada (2.5 million hectares). Globally, the world lost more than 18 million hectares (69,500 square miles) of tree cover in 2013 including both permanent deforestation and temporary losses due to harvesting, fires and other disturbances. 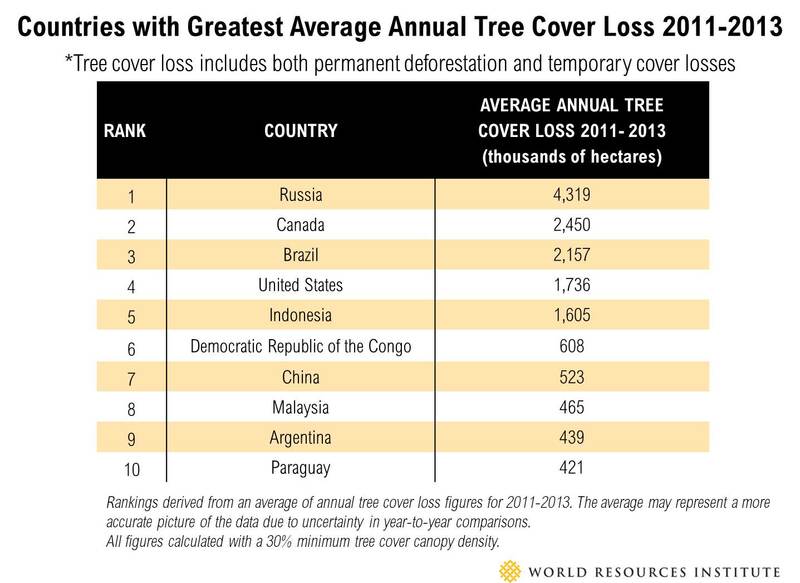 The data find that Russia, Canada, Brazil (2.2 million hectares), the United States (1.7 million hectares) and Indonesia (1.6 million hectares) make up the top five countries for average annual tree cover loss, which measures removal or death of trees within a given area, from 2011-2013. In 2013 alone, Indonesia experienced the lowest tree cover loss in a decade. Studies estimate that fires accounted for around 70 percent of total tree cover loss in Canada and Russia in recent years. In some regions, boreal forests are burning more now than at any time in the last 10,000 years. Researchers anticipate that climate change will increase the frequency and intensity of boreal forest fires, producing more late-season fires that kill trees, and releasing emissions from burning trees and peat soils. Although tree cover loss remains alarmingly high globally, there are encouraging indications that some countries, including Indonesia, are having success in slowing the rates of permanent tree cover loss, or deforestation, in important forest areas. Indonesia’s annual tree cover loss declined in 2013 to the lowest point in almost a decade. Possible reasons for the change include a moratorium on new concessions for forest conversion, a significant decline in agricultural commodity prices (especially palm oil), corporate zero-deforestation commitments, and the fact that much of the most accessible forests have been already cleared. But, more research needs to be done to confirm the trend and underlying drivers of this shift. "Halting the loss of the world's carbon-rich forests and peatlands is necessary if we are going to keep climate change at bay," said Tine Sundtoft, Minister of Climate and Environment, Norway. "The new figures give reason to hope that measures to reduce deforestation in Indonesia are having a positive effect. I hope to see further measures and reduction under the new administration." The new data come from the University of Maryland and Google, and represent the largest and most up-to-date global data set for tree cover loss. With the addition of these data, Global Forest Watch now features tree cover loss data spanning 2000-2013 at a 30-meter resolution. Tree cover loss is a measure of the total loss of all trees within a specific area regardless of the cause. It includes both permanent human-driven deforestation due to expanding agriculture and infrastucture, as well as temporary tree cover loss from forest fires (both natural and man-caused), logging, plantation harvesting, and tree mortality due to disease and other natural causes. The new data was made possible through free public access to satellite imagery provided by the U.S. Geological Survey Landsat program, in partnership with NASA. The new 2013 data is publicly available through maps, data visualizations, and downloads at globalforestwatch.org. Tree cover loss can also be monitored through near real-time alerts such as FORMA, Imazon SAD alerts, and Terra-i alerts. For more information visit www.globalforestwatch.org.